The attorneys at Asquith & Mahoney, PC, work closely with our clients to arrive at the best possible legal resolution of their claim. 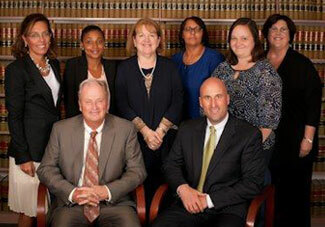 We handle every aspect of your case in the most cost-effective manner possible. At Asquith & Mahoney, PC, we have experience mediating and arbitrating cases. The goal of our firm is the timely resolution of your case so that you can move forward with your life. Our firm frequently receives referrals from other clients who have been impressed with the results we obtained resolving their estate planning, education law and other civil matters. We frequently receive referrals from other attorneys looking for the best possible outcome for their clients. The trial experience of our attorneys provides you a winning advantage. While skillful at negotiating the best possible settlement, we have over 75 years of combined litigation experience in state and federal court. Besides an excellent support staff, we have at our disposal a variety of local resources, including expert witnesses, which we use and recommend to our clientele. John ("Jack") R. Mahoney has received an AV Preeminent rating* from his peers and a "Superb" rating from Avvo; John W. Mahoney, in addition to his AV Preeminent rating* and a "Superb" and "Client's Choice Award" from Avvo, was selected for inclusion in 2013 Rhode Island Super Lawyers, as a "Rising Star." All four of our attorneys have spent their entire professional careers in Rhode Island. We also have an attorney licensed to practice law in Massachusetts and another licensed to practice law in Connecticut. Remembering Harry W. Asquith Jr. The law firm of Asquith & Mahoney, PC, suffered a tremendous loss upon the death of founding partner, Harry Asquith, in May, 2013. Harry was diagnosed with advanced stage pancreatic cancer in November 2011 just before his 59th birthday. Following in his father's, Harry W. Asquith Sr.'s footsteps, Harry was a respected and skilled trial and business attorney for 34 years. Harry served as an East Providence Municipal Court Judge and as a Probate Judge for the Town of Lincoln. He and Jack Mahoney formed the current firm in 1994, and developed a robust and growing law practice. Their success derived from word-of-mouth referrals by clients and fellow lawyers quick to seek out their opinion, advice and sharply honed mediation and dispute resolution skills. His partner, associates, long-time assistant and staff will forever appreciate Harry's wisdom, humor and loyalty. If you require professional legal representation or are in need of our ADR services, contact us at 401-331-5353. 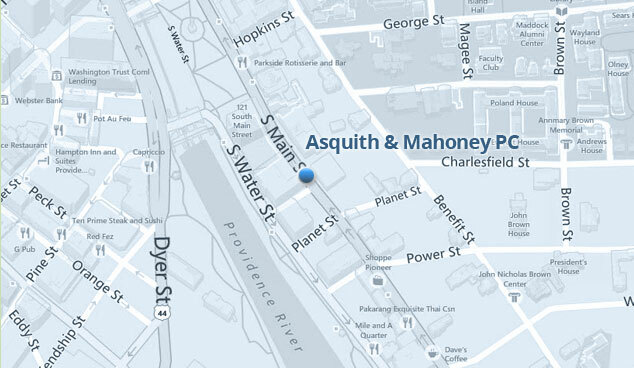 Asquith & Mahoney, PC, is located in Providence, Rhode Island, and represents clients in a variety of civil legal matters in Woonsocket, Providence, Cranston, Warwick, Narragansett and Westerly.